The picture above shows Turnbulls cabinet, the outer ministry and the parliamentary secretaries (called assistant ministers). Our investigation of the second Turnbull Ministry reveals the dominance of two professions - lawyers and accountants. The Liberal Party have 18 cabinet ministers and of those 12 are lawyers. The Liberals have another 5 lawyers in the outer ministry and assistant ministers, a total of 17 lawyers. The Liberals have 4 accountants in the cabinet. No other professions are represented. The Nationals and Liberal-Nationals have 1 lawyer who is 'Assistant Minister to the Prime Minister'. Obviously Turnbull prefers to surround himself with lawyers? We termed 'accountants' anybody with a finance degree. This includes economics, taxation, business and 'applied economic geography' which is treasurer Morrison's background. There is just 1 doctor of medicine, the Nationals Dr David Gillespie and he is an assistant minister. The Minister for Health has degrees in taxation and accountancy but not health. We have lawyers running defence, environment, employment, trade, foreign affairs, finance and social services. In the outer ministry, as well as lawyers and accountants we see a few arts degrees, two journalists and a career politician. Strangely, we have a British-born ex-fisherman as Minister for Indigenous Affairs. There is an indigenous member of the Turnbull ministry who is the 'Assistant Minister for Health and Aged Care'. We only found one person that ran their own business and she is an assistant minister. Anybody with real world experience has been relegated to the outer ministry or is a parliamentary secretary. By excluding all other life skills except law and finance, Turnbull has created the most inward-looking government in Australia's history. No wonder they are constantly bungling routine government activities? They also 'blame the victims' for government mistakes such as irresponsible borrowing. And it's taking it's toll. 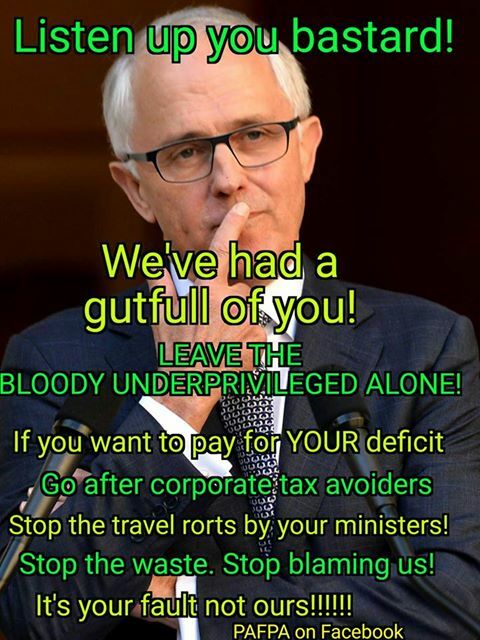 As the angst rises in Australia caused by this dysfunctional cartel of corporate lawyers and bean-counters, we decided this facebook graphic says it best.